The Perfect Gift for Birthdays, Holidays, and More. We Personalize This Stainless Steel Thermal Bottle Tumbler with Any Name of Your Choice. 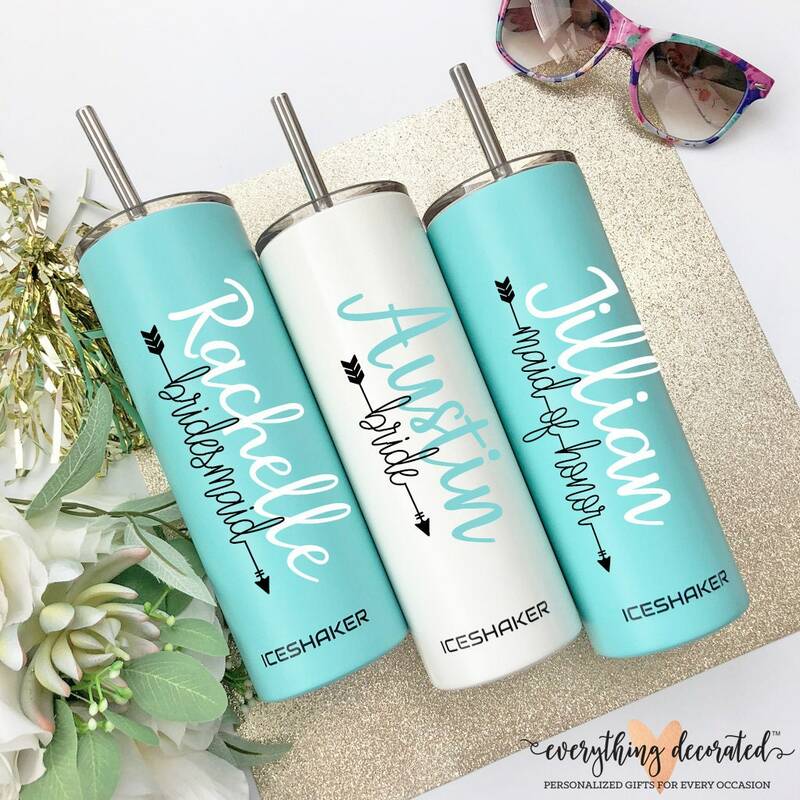 We can Customize The Name on This Tumbler with Any of Our Vinyl Colors - Choose Her Favorite! 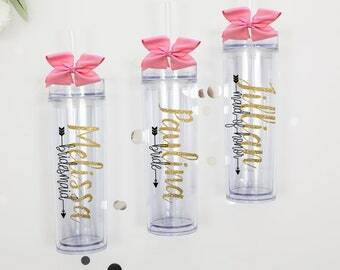 Each Tumbler Comes with a Straw and Push Down Lid. These Stainless Bottles Keeps Drinks Cold for 24 Hours and Hot for 12 Hours. 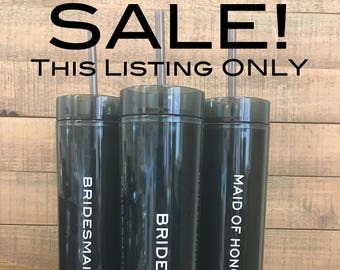 This Listing is for Any Quantity, Starting with One Stainless Tumbler. PLEASE NOTE: The Title Font WILL OVERLAP THE NAME!! 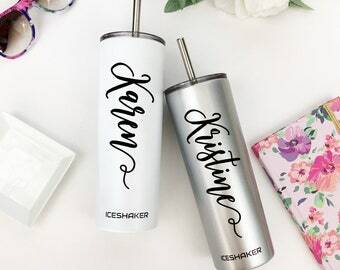 Please Note - the stainless tumbler (silver) will not come with IceShaker logo on the cup- the logo wasn't not printed by the manufacturer however they are IceShaker brand. Please Select Your Quantity, and Vinyl Color, Then Add This Listing to Your Cart. Upon Checkout, Please Include the Name(s) for Each Tumbler. If you Select Name and Title, Please Include the Title(s) with the Name(s) - we Can Customize with Any Title. 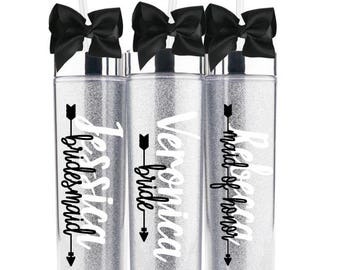 The Fonts are Set for This Design - Please Let us Know the Colors for the Bottle too! Please Visit or Other Shops for More Custom Gifts! We Accept All Credit and Debit Card Transactions Through Direct Checkout Via Etsy or PayPal. Due to the Nature of Our Business, All Sales are Final. Please be Sure to Double Check that Your Personalization Information is Correct Prior to Submitting Your Order. Proofs Available Upon Request Only. In the Event You Receive a Damaged Item, Please Inform Us within 48 Hours of Delivery. Please Email a Photo of the Damaged Item Along with a Description of the Damage to be Eligible for a Free Replacement. In the Event You Receive an Item that Was Made in Error, Please Send a Photograph Along with a Description of the Item that was Made Incorrectly and We Will Mail You a Replacement Within 48 Hours. Once Your Order is Complete You Will Receive a Confirmation Email Along with Tracking from one of our two Shipping Service Providers: USPS or UPS. Insurance is Included with our Shipping and Handling Rates. Shipping Generally Takes 2-5 Business Days (USA Destination - International can Take up to 15 Business Days Depending on Customs). Our Current Processing Time is 5 Business Days. Rush Processing is Available Through our Shop for an Additional Flat Fee - Please Email us for More Information. Please Make Sure Your Address is Correct. If the Package Gets Returned Due to an Incorrect Address, you Will be Responsible for the Shipping Charges to Reship the Package to You. Decorated Bliss is Not Responsible for Delayed or Lost Package via UPS or USPS. By Making a Purchase with our company, Buyer Agrees to all Terms and Conditions. Please Make Note: Shipping Price for all International Orders Does not Include any Custom Duty or Tax Your Country may Impose. We Love Custom Orders! Please be Sure to Visit Our Other Custom Shops! By Purchasing from Decorated Bliss, an Everything Decorated shop, you are giving explicit consent to join our newsletter that will be used exclusively to promote new products, special events, sales, deals and coupons. If you do not want to receive these emails please opt out by unsubscribing at the bottom of the email. By purchasing any item sold by DecoratedBliss the buyer expressly warrants that he/she is in compliance with all applicable Federal, State, and Local laws and regulations regarding the purchase, ownership, and use of the item. It shall be the buyer's responsibility to comply with all Federal, State and Local laws governing the sale of any items listed, illustrated or sold. The buyer expressly agrees to indemnify and hold harmless DecoratedBliss, EngravingsOnDemand, and EverythingDecorated for all claims resulting directly or indirectly from the purchase, ownership, or use of the item in violation of applicable Federal, State, and Local laws or regulations. Buyer further warrants that he/she is 18 years of age or older, and understands that some items sold by DecoratedBliss are dangerous if misused. 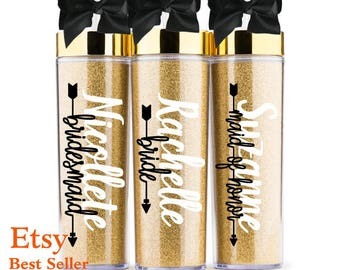 Buyer expressly agrees to indemnify and hold harmless EverythingDecorated, DecoratedBliss, and EngravingsOnDemand for injuries which may result from use of products sold by us.